Picture how your management team would respond if you asked them to design and implement a plan to reinvent your core business within the next few years. Paralysis might set in due to risk aversion or they might come to a hasty decision under extreme stress. Due to confirmation bias, people can usually find experts and statistics to back up just about any idea, no matter how wrong it is. Our research shows that successful innovations more reliably emerges from a process of hypothesis testing and iterative improvement. Although no one can see the future, there’s no question that the assumptions underlying many market projections no longer apply. Ready or not, disruptive competition has arrived and no industry is exempt from its influence. Your management team will need to make critical strategic decisions based on incomplete and rapidly changing data. Uncertainty is the new status quo. How will your organization navigate these storms? A great idea is not enough. After analyzing data compiled from 6,000+ practical innovation initiatives across 62 countries, we have derived best practices in bringing great ideas to life. We’ve identified which capabilities tend to correlate with successful projects. Great ideas mature into successful innovations when supported by an intelligent, agile, and adaptive market strategy. Don’t take chances with the continuity of your business. The Innovation360 consulting tools and methods are compliant with published CEN 16555 standards, the new ISO/TC 279 guidance and the developing ISO 50501 standards for Innovation Systems Management (ISM). We treat these not as goals but as baselines. While some management teams have stumbled onto winning strategies, their organizations have often been blindsided by disruptive competitors, sometimes from other industries. Instead of relying on a single innovation, top firms are fostering a culture of innovation. Business continuity is better protected by a recurrent system of idea generation, development, and execution. After shepherding your innovative concept to the best possible project launch, you must expertly bring into play a new set of skills and tools. At this stage, your primary goal should be to protect and nurture each innovation until it is robust enough to propel its own growth. Our data analysis found a strong positive correlation, approximately +0.55, between successful innovation and organizational growth. 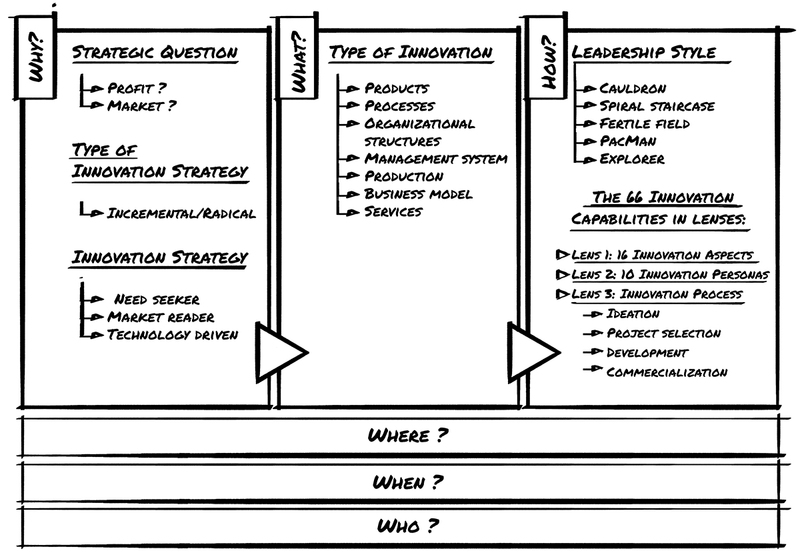 Our Innovation Framework covers all the stages from identifying categories of innovation strategies to laying out 66 essential Innovation Capabilities, seen through Three Lenses. Learn how leading firms have used Platform Thinking and Design Thinking to upgrade their strategy from materials-first to customer-first and delivered a better customer experience. To see your new ideas through to adoption in a volatile, global marketplace, you will need to plan two moves ahead of competition. The quality of preparation a differentiating factor in who will thrive in the new economy. Contact Innovation360 to learn more about data-driven innovation analytics and how they help you turn creative ideas into market-defining innovations. 78% of the enterprises state that their organizations are making substantial efforts to innovate. 81% of the enterprises say that they innovate to expand their markets. 74% say they innovate to increase profits. Organizations stating that they seek market growth more than profit are characterized by a dominant leadership style we call the “fertile field” leadership style, while those claiming to be driven by profit over growth are characterized by the “spiral staircase” leadership style. DNA Focus: People within the organization discuss and analyze regularly what employees are really good at and what differentiates its customer value proposition, which extends far beyond traditional customer specifications and evaluations. There are many famous and successful companies in this category, ranging from IBM to Google and Volvo to 3M. Real Need Focus: The organization tries to satisfy its customers’ real needs, not the needs identified by customers in response to direct questions. One well-known example is Apple – time after time, they have launched superior products based on need rather than apparent market and customer requirements. The same is true for many famous luxury brands. Technology-Driven Strategy: The organization follows the directions suggested by its technological capabilities, leveraging its investments in research and development to drive breakthrough innovation and incremental change, seeking to solve the unarticulated needs of its customers. Measure your own organization’s capabilities using Innovation360’s readiness assessment, the InnoSurvey®.